The capitol of Washington State, Olympia is particularly renowned for its striking beauty, set at the southern end of the Puget Sound with the Olympic Mountains to the northwest providing a dramatic backdrop to Budd Inlet and soaring Mount Rainier to the southeast adjacent to the impressive capitol building and Capitol Lake. 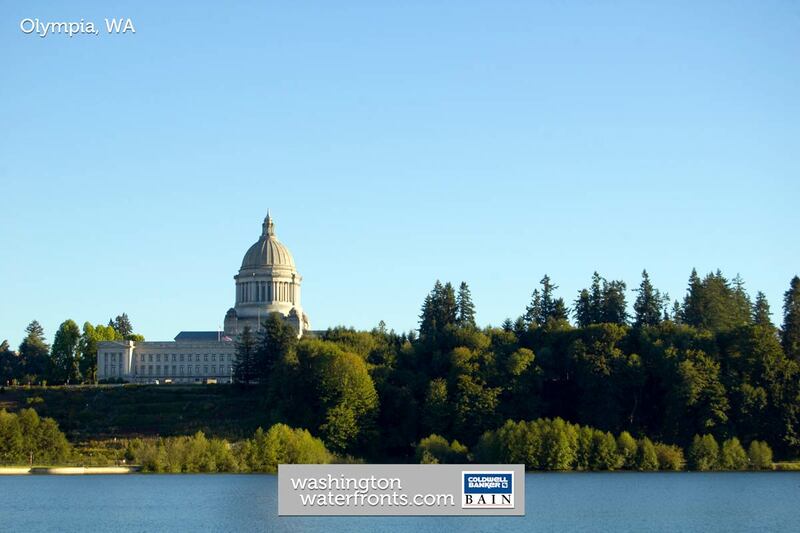 With so much water, it’s not surprising that there is a wide range of Olympia waterfront real estate available to choose from. Olympia offers a unique downtown waterfront experience with its streets lined with a diverse mix of outstanding eateries and storefronts, while the awe-inspiring surrounds are popular for everything from sailing and fishing to hiking, mountain biking and wildlife watching. Here, waterfront real estate owners enjoy the best of both worlds with easy access to city amenities and outdoor delights, while coming home to a peaceful setting for soaking up nature’s beauty. In Olympia, waterfront real estate incudes everything from lakeside properties with homes on Capitol Lake, popular for picturesque strolls along the low banks to the West Bay and the East Bay. East Bay homeowners can look forward to easy access to parks like East Bay Waterfront Park with its scenic views of lower Budd Inlet and the Olympics, and West Bay, providing close proximity to Percival Landing Park in the heart of downtown on the east side of Budd Inlet which serves as a hub for gatherings, public celebrations and all sorts of social interaction. The myriad of fantastic Olympia waterfront offerings available may make the decision as to which home to choose a little more challenging, but potential buyers will be happy to find that waterfront homes here offer some of the Puget Sound’s very best values, making those spectacular waterfront views more achievable than ever. Take advantage of our industry-leading tools to make your property search as easy as possible and be sure to register for a FREE account so that you can receive email alerts whenever new Olympia waterfront real estate for sale hits the market. If you're seeking to sell your Olympia waterfront property, contact our Waterfront Specialists directly for a comprehensive listing analysis and to learn more about the cutting-edge marketing strategies we'll use to sell your home quickly for top dollar!